Rock solid England captain Billy Wright was the first player in the world to gain 100 caps for his national side. He started his career in 1934 with Wolverhampton Wanderers the team that he would play for the rest of his career. 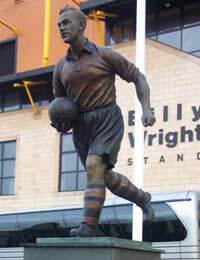 Nicknamed the ‘Ironbridge Rocket’ after the town where he was born, Wright actually started on the ground staff of Wolves. He worked his way up to playing, making his debut in 1939, and taking over as captain shortly after the league resumed, once World War II was over. The FA' International Selection Committee picked him for the first match to be held after the war, in 1946 against Northern Ireland in the Home Championship, and once he was in the defence, he was rarely out of it. England won 7-2 with another debutant, Wilf Mannion, getting a hat-trick. Two days later England played the Republic of Ireland in a friendly and only managed a 1-0 win, but Wright got good press with an authoritative display. In Wright’s fifth match, against Scotland in 1948, his partnership with Neil Franklin, who gained 26 caps, was spoken of very highly. In a friendly the following year against Italy, World Cup winners in 1934 and 1938, the pair were largely responsible for containing the Azzurri as England beat them 4-0 in Turin. Regular England captain George Hardwick had received a knee injury in a violent match against Scotland in 1948 which led to the end of his international career. After three matches with Frank Swift, the goalkeeper, standing in, Billy Wright was selected as captain for the Home Championship game against Northern Ireland, a match that England won 6-2. Wright was now ever present in the team and was beginning to show penetrating passes from defence as well as solid and sure defending, and even scoring the first of his three goals, against France in 1949. It was the first time a non-forward had scored since the war. His second goal, six months later in a 2-0 win against Italy at Highbury, was a complete fluke, sending a long ball over from the half-way line which the goalkeeper misjudged in the swirling wind as it sailed straight over him. Wright led England to their first World Cup in 1950, but Neil Franklin would not be going, as he was joining a club in Bogotá and FIFA did not recognise the Columbian FA. It was hard for Franklin and the other English players who had gone to settle, and Franklin was back within two months, but would never be allowed to play for England again. This seriously disrupted England's solidity at the back and it would be many years before Wright would find a regular defensive partner. The level of seriousness attached to the World Cup was indicated by the FA organising a tour of Canada just beforehand, and Manchester United trying to withdraw their players to go on a summer tour instead! So it was no surprise that England limped home after failing to progress from the group stage. The humiliation included a 1-0 defeat by a scratch United States team, with Stanley Matthews watching on the sidelines. Matthews hadn’t been available for the first match, a 2-0 win against Chile, as he was still travelling from Canada, and the selectors refused England coach Walter Winterbottom’s pleas to play him. Watching this unfold was the full-back, Alf Ramsey; watching this farce must have been crucial when it came to his later decision, to face down the FA and demand complete control of team matters when he was appointed manager in 1963. Back at home Wright scored his third and final England goal, a shot that went through a crowd of players, in a 4-1 win against Northern Ireland, then missed his first match in 33 games, through injury, Alf Ramsey filling in as captain. In 1952, despite having been dropped for a game or two through loss of form after his injury, Wright took the England caps record from Bob Crompton as he appeared against Switzerland, in a 3-1 win, for his 43rd cap. A few games later, in a 5-2 win over Wales, Wright played at centre-half for the first time. Wright is remembered as the colossus at the heart of the English defence for nearly a decade and a half, but in fact, this was a late conversion and he played over half his England career as a right-half. This isn’t so unusual these days, as players are expected to be able to switch formations, but in those days it was 2-3-5 with the ‘3’ lining up in the middle: left-half, centre-half and right-half and to change was unusual. The next World Cup was in 1954 but before that further humiliation would be visited upon Wright and the England team, still struggling with an archaic playing style and administration. The Hungarian side of Ferenc Puskas came to Wembley and beat England 3-6 in a display that totally outclassed England. Wright himself was the recipient of the first drag back that he had ever seen as Puskas completely fooled him then chipped the keeper for one of his two goals. It was the first time a team from outside the British Isles had beaten England at home. But worse was to come, as England, with Wright as one of only four team members who survived from that game, went to Belgrade a year later for the return match. Puskas gave Wright the run-around for the whole game, which, at 7-1, remains the worst defeat England have ever suffered. The World Cup duly came and went, with Wright switching to centre-half permanently, but it wasn’t enough to stop the defensive lapses, with Gil Merrick in the England goal particularly at fault. England managed to get past the group stage but were outclassed by Uruguay, losing 4-2. Two years later England played the Brazilian team, who would go on to win the 1958 World Cup, in a friendly at Wembley, and Wright’s captaincy skills passed their hardest test with flying colours. The Brazilians had threatened to walk off the pitch after a disputed penalty was awarded and it took all Wright’s calm, cool manner to restore peace. There had been so much fuss that the penalty was missed in any case! Wright was still the mainstay of the defence for that 1958 World Cup but again England did not do as well as they hoped. Stanley Matthews had played his last England game in the last qualifier against Denmark, but many people reckoned that he should have been taken, as just having him around was such a confidence boost. That was not the only disaster though. Early in 1958 the Munich air crash that decimated the Manchester United team claimed at least three England players, Tommy Taylor, Roger Byrne and the unbelievably good Duncan Edwards. Still, creditable draws against Russia, Brazil and Austria were enough to force a play-off with Russia to decide who went through; unfortunately it was Russia, 1-0. The usual diet of the odd friendly and Home Championship matches was resumed after the World Cup and on an historic day in April 1959 Wright won his 100th cap, the first footballer to do so. England ran out 1-0 winners against Scotland, the score largely being kept down by a superb goalkeeping display by the Scots goalkeeper, Bill Brown. Wright was shouldered off the pitch and given a true sporting hero’s ovation. Wright carried on for another five games until he decided to retire, last cap being awarded at a tour match against the USA, in front of just 13,000 fans in Los Angeles. The 8-1 win was another satisfying revenge for the 1-0 defeat all those years ago. Since being dropped in 1952 he had played in every England international; that record of 70 consecutive appearances still stands, and he shares his record of 90 games as captain with Bobby Moore. He was also never booked or sent off in his career, including his 541 games for Wolves. Billy Wright was also the first footballer to emerge into the wider world of celebrity, marrying one of the Beverley Sisters, Joy, and advertising hair products. But his value to English football was proved when he was the first player to be inducted into the English Football Hall of Fame in 2002.